Guitar Method or Supplement; Method/Instruction. Ultimate Beginner Series. Bluegrass and Learn To Play. Instructional book and examples CD. With introductory text, instructional text, instructional photos, standard guitar notation, guitar tablature and strum and pick patterns. 88 pages. Alfred Music #00-0381B. Published by Alfred Music (AP.0381B). ISBN 0769285392. 9x12 inches. English. 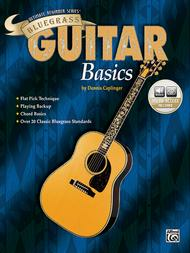 Bluegrass Guitar Basics covers all the basics and will have you playing all the classic bluegrass favorites in no time. You'll learn classic bluegrass guitar techniques in the context of classic bluegrass standards. Beginning with basic left- and right-hand techniques, Dennis guides you through developing great backup parts, playing solos, and working with a bluegrass band. All books and DVDs in the Ultimate Beginner Bluegrass Basics Series are fully correlated to work together, allowing you to use these for putting together your own bluegrass band.